In the summer of 2017, I took two substantial internships that allowed me to put policy theory into practice and will be invaluable to me as pursue my Law and Public Policy degree at the O’Neill School of Public and Environmental Affairs. As an intern for Indianapolis Mayor Joe Hogsett, my duties varied day-to-day according to administrative priorities. One day I participated in a meeting discussing a potential program to lower the failure-to-appear rate in our courts. I also spent time researching potential programs to improve the lives of Indianapolis citizens, and then worked to identify the logistics behind creating those programs. On another day, I worked on creating the new “Welcome to Indianapolis” display at the Indianapolis International Airport. On other days, I answered telephones, taking complaints as well as compliments. As an intern with U.S. Senator Joe Donnelly’s office, my responsibilities were more routine. On a typical day, I would speak to constituents about a variety of concerns: social security problems, the Senate proposed healthcare bill, Senate confirmations, the Russia investigation, and an array of other issues. Some days constituents would call crying with worry and other days constituents would call and yell about their concerns. My role was to listen and document their concerns so that staff would be able to follow up appropriately. 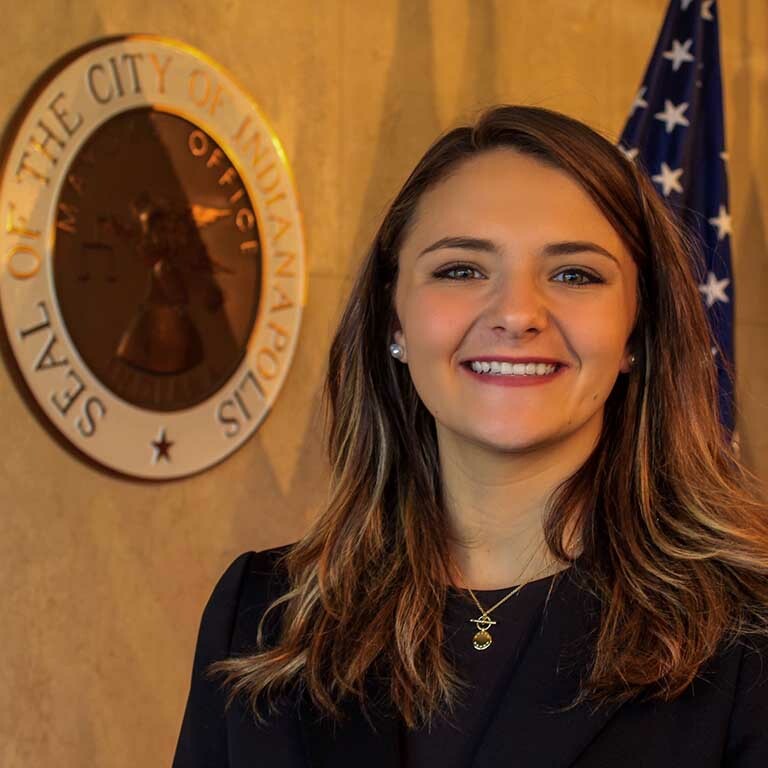 Abigail Callen, Law and Public Policy major, interned with the offices of Indianapolis Mayor Joe Hogsett and Senator Joe Donnelly. This was a huge lightbulb moment for me. Any career path will require a substantial amount of time writing. Start practicing NOW! As my first position in a professional business atmosphere, I did not know what to expect. Although the office environment was relatively relaxed, it taught me how to behave in the workplace. At times I became so frustrated that I wanted to walk away and pout like a child, but I reminded myself of the setting I was in, took some deep breaths, and pushed through. Although sometimes I have to remind myself to use my “inside voice,” I adapted to office life. I sought internship opportunities for a positive learning experience, but these positions also served as a resume builder. I started my internships with a resume of volunteer and student jobs but leave with professional experience that translates to marketable work skills. Building a good relationship with your manager or supervisor should be one of your top priorities. Gain your manager’s trust by meeting deadlines, seeking additional work, and offering solutions. As you build trust with your manager, you may have an opportunity for additional responsibilities. Don’t forget, they will be writing your letters of recommendation for future opportunities! Also, don’t forget your coworkers. It is important to network with them for the future and—who knows— they might just wind up becoming your good friends. Internships, along with informational interviews and job shadowing, gave me a real-world perspective that I wouldn’t have received elsewhere. We learn a lot in our classes, but hands-on experience is essential. I was able to experience government in action first-hand, which helped me decide on my future career. While I am not sure that politics is my long-term goal, I do know that I want to pursue a law degree. This summer confirmed my passion for the public defenders role in the judicial process and my passion for criminal justice reform. I am looking forward to my O’Neill classes and continuing to pursue my degree relying on some of the experiences and skills I gained this summer as an intern with Senator Donnelly and Mayor Hogsett.